After almost a year without writing in my blog, the little writing bug has come back. I'm not entirely sure why I stopped - sometimes I don't know what to write about, or I'm just too lazy, or I simply can't find the time to sit down and write about what I want because of university. But here I am again. And I'm bringing you something I don't think I have ever done before - a recommendation. Trust me, if I take the time to write you this is because I bloody well love this place! It's called 'A Padaria Portuguesa' and you can find it almost anywhere in Lisbon. It's a cute café with a rustic vibe to it, extremely cozy. They serve salads, sandwhiches, every kind of bread and they have a multitude of cakes to choose from. 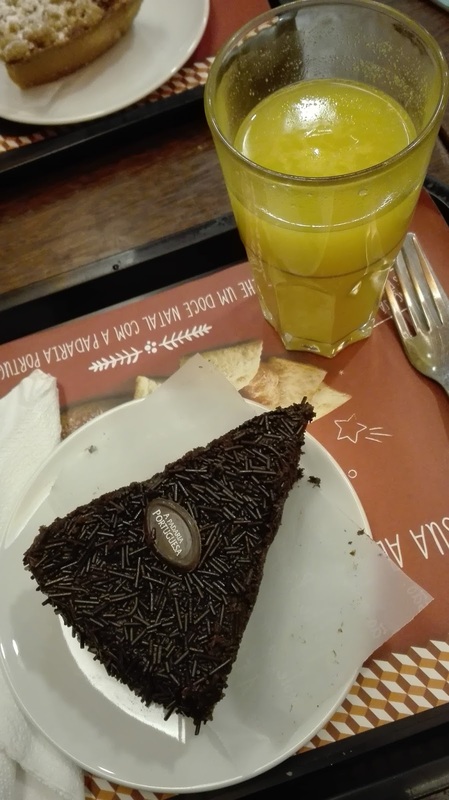 The first time I went there was to try their brigadeiro cake (probably a poor translation for 'bolo de brigadeiro'), my mouth is already watering. It was so delicious. More recently I went in there to try their new 'tarte de morango' (again, I don't really know how to translate that haha). 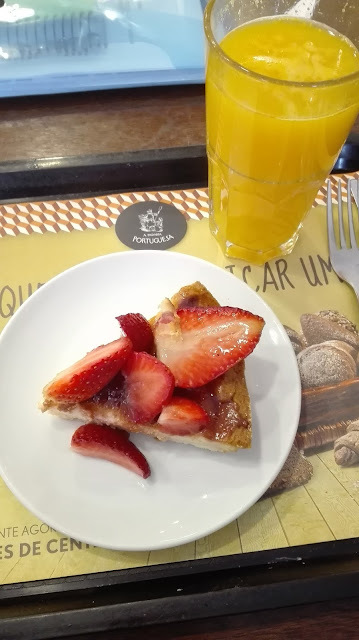 I always ask for an orange juice but you could take advantage of their deal of a cake + a coffee for 2€. If you ever visit Lisbon and don't know where to grab a bite, don't forget my recommendation, you won't regret it!